Boundaries and Self-Esteem in Couple Life! Check Out this Powerful GRID! THE RELATIONSHIP GRID – A Fascinating Tool Created by Terry Real, Master Couples’ Therapist! WHERE ARE YOU BOTH ON THE RELATIONSHIP GRID? ANOTHER WAY TO DESCRIBE OUR STYLE OF STUCKNESS & CREATE A DOOR OUT! Check out this amazing grid for understanding those rigid positions we can get locked into in couple life, positions that block intimacy – created by Terry Real, master couples therapist! What do you notice about your self-esteem style these days? What do you notice about your boundary style these days? This training from Terry Real can help you and your partner map out a new route to peace and balance in these two areas! This Relationship Grid is one of those powerful tools for awareness building, like the Enneagram of Personality, that can help us build a door out of unhealthy patterns, and into behaviors that work much better with our partner. Use it for regular relationship CHECK-UPS! Intimacy health is not a destination, it’s a dynamic process of growth, one we commit to if we want to have rewarding and fulfilling relationships. Just like Enneagram Type awareness and development! 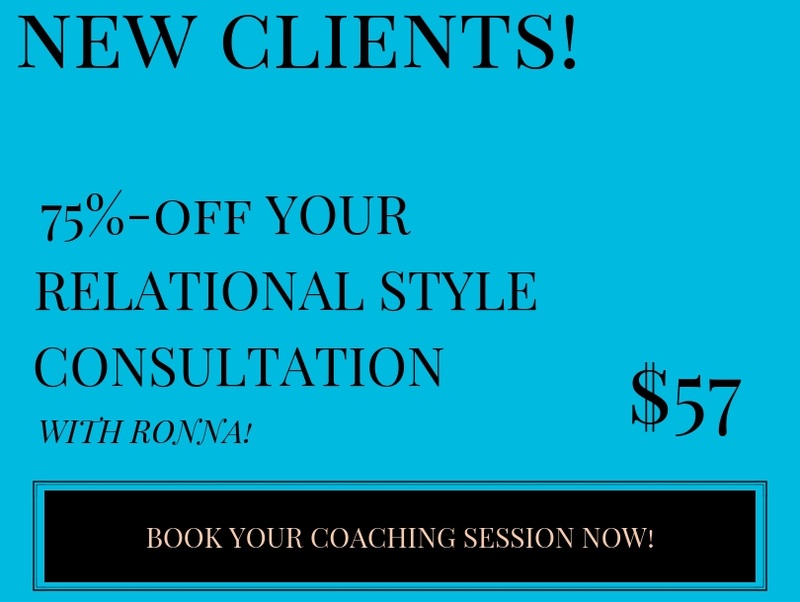 (In fact, I bet you’ll notice that as you and your partner get healthier at intimacy (self-esteem and boundaries), you will notice that your Enneagram Type issues soften, moving up the Riso-Hudson Levels of Development. Love and relational health are deeply interdependent. So we can conclude that love and personality health are deeply interdependent as well. 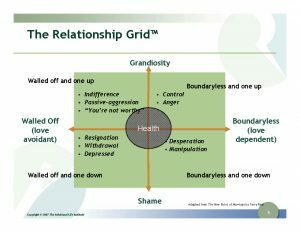 As Terry Real’s Relationship Grid shows us, unhealthy relational patterns like shame and compromised boundaries show up in varied ways. Shame can be expressed as self-contempt or grandiosity; lack of good healthy boundaries can mean over-reactivity or under-responsiveness to others. Our personality can sometimes DEFINE those patterns as its own version of love, and frightens us into continuing to seek that version of love. Yet that ersatz version of love is never fulfilling. Even though our personality usually has a powerful agenda that it pushes as its version of love, we can remind ourselves that we are going for the REAL thing here. Look at You…Comin’ in for Your Relationship Check-up! Nice Work! Our Inner INDIVIDUALIST (Type 4) Teaches Us Something Important about Marriage – Authentic Happiness, Nice Guys, & the Hedonic Tread Mill! Creating a healthy Relational Environment for Diabetic Family Members! If you answered yes to even a few of the above, then you probably set and maintain poor boundaries in your relationships. If you answered a resounding yes to most or all of the items above, you not only have a major boundary problem in your relationships, but you also probably have some other personal problems going on in your life. Karter, thanks for engaging. And your points are correct, as far as they go. I would invite you to explore a deeper level of wisdom in your analysis: go beyond the “you statements.” Breathe, sit with the tool for a while, and see if you can find yourself on the grid. Usually that’s a better path to helping others, finding the resonating experience in your own relational growth path. I would challenge anyone who thinks they have no work to do in these areas to recognize that illusion as a symptom of being fairly lost in one or more of the squares in the grid. I’ve learn some excellent stuff here. Certainly value bokonarkimg for revisiting. I wonder how a lot attempt you place to make such a fantastic informative web site. Thankfulness to my father who informed me regarding this webpage, this website is actually remarkable. I love it when folks get together and share views. Great site, continue the good work! I just want to say I’m very new to blogs and actually enjoyed this web site. More than likely I’m going to bookmark your blog post . You absolutely come with good article content. Appreciate it for sharing your blog site. I am extremely impressed with your writing skills and also with the structure in your blog. Is that this a paid theme or did you modify it yourself? Either way keep up the excellent high quality writing, it’s rare to look a nice blog like this one nowadays..
i’m new to this, I stumbled upon this I’ve found It absolutely useful and it has helped me out loads. I am hoping to give a contribution; assist other users like its aided me. Great job. Hey there, You’ve done an excellent job. I’ll definitely digg it and personally recommend to my friends. I am confident they will be benefited from this website.